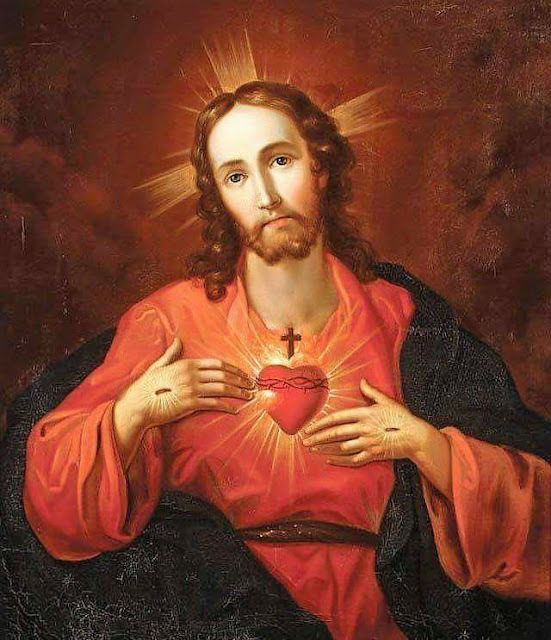 The Sacred Heart of Jesus, is especially celebrated on the Solemnity of the Sacred Heart (the Friday after the second Sunday following Pentecost) is celebrated on June 8, 2018. Traditionally, “enthronement,” or “consecration” prayers of your house (family and heart) to Jesus are said. Jesus promised to Saint Margaret Mary Alacoque that, “I will bless the homes where an image of My Heart shall be exposed and honored.” Thus, enthronement consists of reciting the prayer and placing an image of the Sacred Heart of Jesus in one's home. This is especially powerful against Evil which can attack the people of God in their homes. I beseech Thee, through Thine infinite Goodness, grant that my name be engraved upon Thy Heart, for in this I place all my happiness and all my glory, to live and to die as one of Thy devoted servants. Amen.